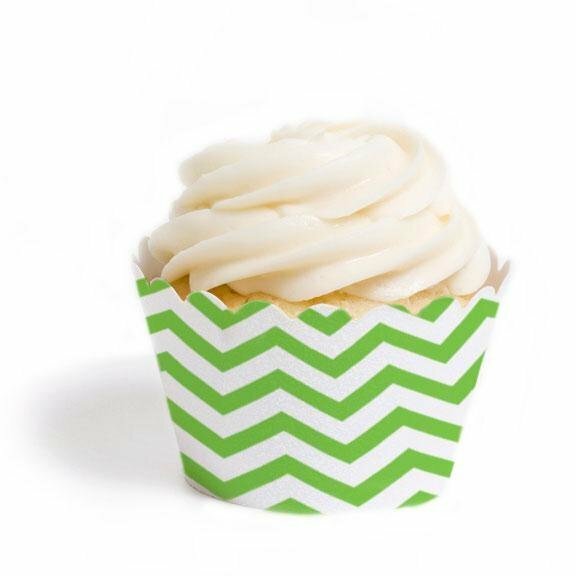 Our zesty lime green chevron print cupcake wrappers are very popular for parties, chevron is all the rage for decorating parties right now. Great for decorating your birthday party cupcakes or dessert/candy buffet. Your cupcakes will be wrapped with attitude and sure to be a hit at your next event. 12 designer cupcake wrappers per pack. Do not bake in these cupcake wrappers, they are for presentation purposes only. Easy to assemble, simply slide tab into slot. Measures 8.25 cm wide at top (when assembled) x 5 cm high (3.25" x 2"). Mix & match with our huge collection of cupcake wrappers for a stunning cupcake display.